Turkey's Foreign Minister Mevlut Cavusoglu has warned against extending use of Incirlik Air Base to countries that prefer to sit on their hands when it comes to fighting Daesh terrorists, according to Turkey's state-run news agency Anadolu. 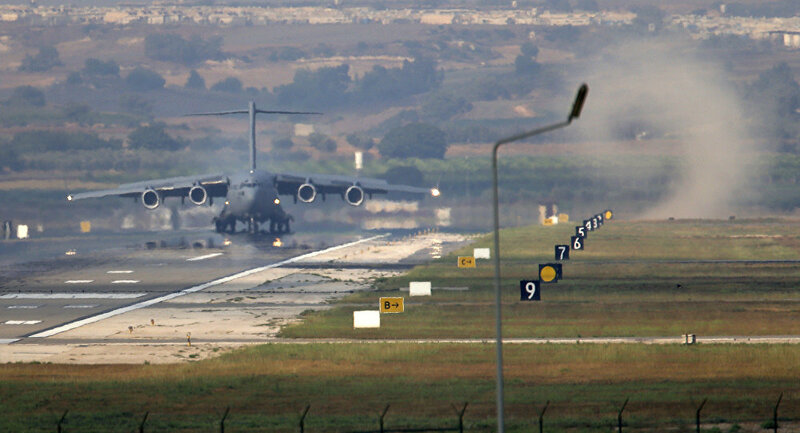 Will 'Grave Crisis' in US-Turkey Relations Affect Incirlik, Home to US Nukes? Turkey's state-run news agency Anadolu quoted the country's Foreign Minister Mevlut Cavusoglu as saying that Incirlik Air Base should not be used by those who do not support Ankara's drive to fight Daesh (ISIL/ISIS) terrorists. US and Turkish aircraft are the primary users of the Incirlik base, located eight kilometers from the Turkish city of Adana. The base is also used by the UK's Royal Air Force and by Royal Saudi Air Force. Incirlik, which houses US B61 nuclear bombs, is central to Washington's military operations in the Middle East. Ankara launched Operation Euphrates Shield on 24 August to push Daesh out of cities and settlements located on Syria's border with Turkey. The military intervention has also been aimed at preventing the Kurdish forces from moving further west and taking control of the border region. "Our people wonder why they [coalition forces] are using Incirlik Airbase [if the coalition does not provide aerial support to the Euphrates Shield operation]. We allowed not only the US but also other countries' jets to use Incirlik to jointly fight [ISIL]," Cavusoglu said. He also slammed the international coalition for lending too little support to Turkey's efforts to combat terrorism. "If this coalition was formed to fight Daesh and Turkey, for its part, created the conditions for effectively countering the terrorists, then why doesn't Ankara get relevant support? ", Cavusoglu said. "The US is a very important ally for us. We cooperate in every field. But the reality is, there is a confidence crisis in the relationship at the moment," he added. Cavusoglu was echoed by Turkish Deputy Prime Minister Veysi Kaynak, who said that the US-led coalition's infrequent use of Incirlik to join the Turkish army's anti-Daesh operations are raising questions among the Turkish population. "[The international coalition's] presence [in Incirlik]is being questioned by our people and nation, and this issue is on the agenda of the government," Kaynak said. Earlier, White House spokesman Josh Earnest warned that Ankara's possible restrictions on the US using Incirlik Air Base may "potentially undermine" Washington's planned support for Turkey's efforts to contain Daesh. — Conflict News (@Conflicts) 6 января 2017 г. According to Ernest, "Turkey remains a critically important ally of NATO" and Washington is ready to offer additional support to Ankara in its fight against Daesh terrorists. Meanwhile, political analyst and former Turkish MP Dr. Oya Akgonenc Mugisuddin said in an interview with Sputnik that Ankara appears to be changing its opinion with regard to US military installations in Turkey, including Incirlik Air Base. New ideas on how to use [these bases] have surfaced. Turkey is extremely discontent with America's activities [in the Middle East] and their implications. Turkish authorities [are pondering] certain changes," Mugisuddin said.